On this date in 1685, an infamous judicial bloodbath claimed its first and most controversial victim. Dame Alice (or Alicia) Lisle (or Lyle) was beheaded in Winchester for harboring fugitives from the Battle of Sedgemoor, where pretender and fellow execution-fodder Monmouth was defeated. Alice Lisle Concealing Fugitives, by Edward Matthew Ward. Detailed views here. 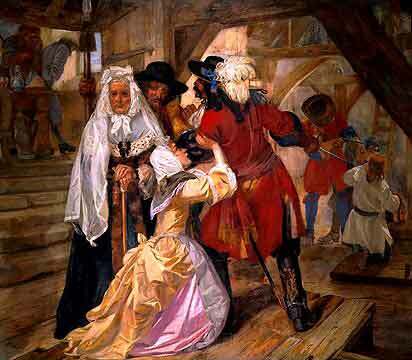 The aged woman had evidently taken in the fugitives John Hickes and Richard Nelthorpe as a humanitarian gesture when they happened to show up at her door; despite her late husband’s part in the regicide of Charles I, Alice Lisle doesn’t seem to have been the political type. So the fact that Lisle was charged with treason was a national (indeed, transatlantic) controversy … and the fact that she was the first of the thousand-plus rebel prisoners tried set the tone for the legal circuit this month that became remembered as the Bloody Assizes. In an attainder later reversed under William and Mary, Lisle was convicted and condemned to burn (the sentence was commuted to beheading) by notorious hanging judge Lord Jeffreys. Macaulay describes this infamous landmark case. If Lady Alice knew her guests to have been concerned in the insurrection, she was undoubtedly guilty of what in strictness is a capital crime … [t]he feeling which makes the most loyal subject shrink from the thought of giving up to a shameful death the rebel who, vanquished, hunted down, and in mortal agony, begs for a morsel of bread and a cup of water, may be a weakness: but it is surely a weakness very nearly allied to virtue … no English ruler who has been thus baffled, the savage and implacable James [II] alone excepted, has had the barbarity even to think of putting a lady to a cruel and shameful death for so venial and amiable a transgression. The jury retired, and remained long in consultation. The judge grew impatient. He could not conceive, he said, how, in so plain a case, they should even have left the box. He sent a messenger to tell them that, if they did not instantly return, he would adjourn the court and lock them up all night. Thus put to the torture, they came, but came to say that they doubted whether the charge had been made out. Jeffreys expostulated with them vehemently, and, after another consultation, they gave a reluctant verdict of Guilty. Lisle was the only victim of the Assizes at Winchester, but her death would preview the wholesale slaughters to follow. Jeffreys reached Dorchester the next day and his pitiless tribunal began its work of sentencing hundreds to the various modes of English execution, or else to convict transportation — a fate more lucrative for the crown, but little less terrible to its victims. For all that, the Assizes greatly injured the Stuart cause, precisely because of indiscriminately butchering the likes of Alice Lisle. Judge Jeffreys’ reputation as a vicious, politically-motivated jurist landed him in the Tower of London by 1689, when he, er, injudiciously stuck around after James II fled the country; reportedly, Jeffreys was lucky to make it to the Tower under guard from the mob that wanted to tear him apart. Though posterity has the luxury of on-the-one-hand, on-the-other-hand assessment, he remains a villain to most accounts … like the vengeful verse to his memory that prefaces this Victorian text on the Assizes. ‘Till thou roar out for Hemp-sake, Drive on Car-man. E’ne to be hang’d may’st thou the Gauntlet run. Cry out,–‘Tis pitty,–Troth, a proper Man. Revive like Savage, to be hang’d agen. For when thus satisfy’d, I can forgive. Yikes. Jeffreys actually succumbed to a kidney disease a few months into his captivity. Close enough.